Five layers were never enough. Ten minutes outside was too long. It was safe to say Torres del Paine was freezing. I gave away the dream of doing the W Trek in Torres del Paine a few months ago. Given my knee injury not improving before I left the UK, I knew I wouldn’t be able to handle a 5 day hike in Patagonia. Instead I’d just do day treks in El Chalten (post coming on that spot). After meeting a new friend on the plane to El Calafate, she suggested booking a day trip to Torres del Paine. I’d never considered that it was possible to do in a day. Turns out the border to Chile wasn’t too far away from El Calafate and with a small minivan group it wasn’t too time consuming to cross either. Unfortunately the weather in Patagonia is very hard to predict. For instance, as I write this I’m listening to the wind outside in El Chalten, certain that I’d be blown over it I was outside. Yet yesterday it was blue skies and hardly a drop of wind even in the mountains. But back to Torres del Paine. It was cold. I’m sure if you were hiking you’d warm up, but most of our trip was just getting in and out of the minivan. I’m not one to turn down opportunities, but I definitely wasn’t the last one to get in the van each time we stopped and started. Within 5-10 minutes you were freezing, even with 5 layers (2 merino) on! Sadly the weather also cast cloud over all the mountains, so we couldn’t see a lot, but what we did we was pretty awesome. I can imagine hiking the entire W Trek would be amazing. The water was often a bright green-blue colour and we were told this was because of the high level of oxygen in the water, created by these small rubbery micro-organisms (hopefully I heard that correctly). We managed to visit a few waterfalls and do a brief 1.5 hour hike from Salto Grande to Mirador Cuernos and back (at least that’s where I think we were on the map). The hike was quiet and not too cold luckily. We saw loads of dead burnt trees from the fire that occurred a few years ago in the park. It’s hard to imagine just how far it spread, but from the small areas we passed it looked like a massive fire, yet it started ages away from where we were. Sad that such a magnificent place can be so damaged by such a simple act by a tourist by accident. 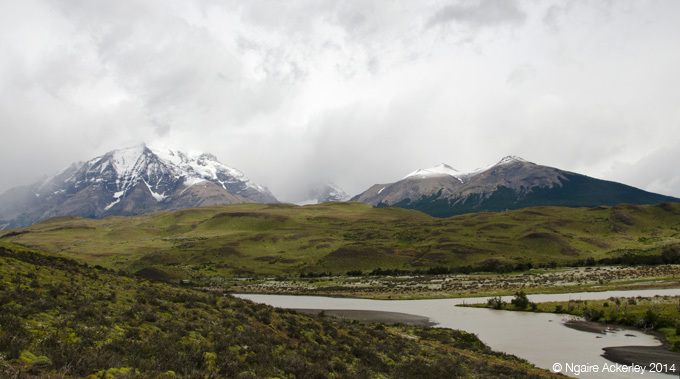 Leaving Torres del Paine, I was a little disappointed that the weather put a dampener on how amazing the scenery can be. It was an incredibly expensive trip (contributing to me going way over budget in Argentina), but I’m still glad I took the chance to visit the park. I’d like to be able to hike it in the future, but you never know what will happen – I may never get the chance to return.